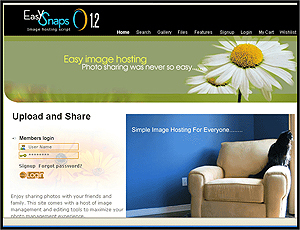 iScripts EasySnaps is an image hosting/photo sharing script with the features like image editing , customizable payment plans for users, image and folder descriptions, a demonstration mode for showing potential customers what they will get, automatic thumbnails, etc... Offer photo hosting service for consumers as a free service or paid service . Supports Authorize.net, Paypal, 2checkout and Google Checkout payment Gateways.This installation is for 2 month FREE trial. It can be extended to regular license by purchasing a paid license and without impacting existing data.